Senses get heightened and imaginations run wild while strolling down the dim, dark passages of the cryptoportiques. Even then, the wonders of ancient roman architecture do not forget to amaze and intrigue you with its brilliance and sophistication. It is still unknown to serve what purpose the cryptoportiques or the cryptoporticus of Arles were really constructed. 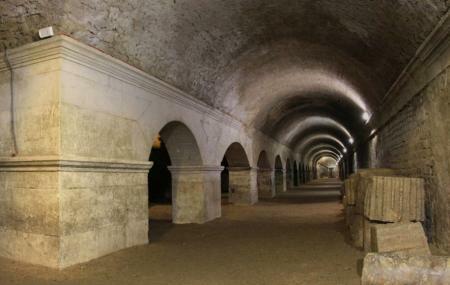 But the sheltered, underground passages, which seem to go on for miles are a delight to explore. Dating back to 1st century BC, the shape of the cryptoportiques is that of a ‘U’ constructed with three double, parallel tunnels. The stonework carries the marks of the Mason’s and signify that it was built by the Greeks. It is believed that it was used as quarters for public slaves. Constructed under the Place du Forum, the cryptoportiques too is UNESCO World Heritage Site and a must visit in order to return to the roman era and understand it better. People normally club together Espace Van Gogh and Theatre Antique D'arles while planning their visit to Cryptoportiques.